“Measure what is measurable and make measurable what is not so.” — said Galileo — surely looking to make more money. EBITDA is an acronym that stands for earnings before interest, taxes, depreciation and amortization. This is a favorite metric for commercial bankers and investors as it represents a modified version of cash flow. Cash is king, and cash flow is the single most important measure of financial success for a brewery. EBITDA will soon be one of your favorite brewery metrics, too. Why you need to pay attention to EBITDA? Breweries invest big money into brewing equipment, infrastructure and the taproom space. These investments require cash, which usually comes in the form of a loan. The loan needs to be paid back in monthly installments. EBITDA, with some adjustments, will show you how much cash flow is available to cover the debt payments on the loan. If the debt payments are higher than EBITDA, you have a problem on your hands. Nothing will kill a brewery business faster than running out of cash. Commercial bankers like EBITDA because it helps them determine whether you can make your loan payments. Investors like EBITDA to determine how much your brewery is worth. You might be interested in EBITDA for these reasons as well. Learn the economics of a taproom vs. distribution for craft breweries. All you gotta do is click, clicky. There are lots of factors that influence the value of your brewery, but none is more important than EBITDA. Volume growth, strength of brands, market penetration, brewery/brewer reputation. All these are important, but EBITDA is still the king of brewery valuation. The value of your brewery, or any business, is what a buyer is willing to pay. Buyers are willing to pay based on cash flow. EBITDA provides a version of that number. A multiple is basically a multiplier. It is the multiple of EBITDA that a buyer is willing to pay. Multiples for breweries will range wildly based on a number of factors. One brewery with strong volume growth, a tight geography and solid portfolio might fetch a multiple of 10 times or more. Meanwhile, another brewery with flat or declining sales, fragmented distributor network and aging equipment might see a multiple of three to five times EBITDA. EBITDA, with some adjustments, will show you how much cash flow is available to cover the debt payments on your loans. The “E” in EBITDA is earnings. Earnings and profit mean the same thing. Therefore, to get EBITDA, you’ll take profit that shows up at the bottom of your income statement and add back interest expense, income tax, depreciation and amortization expense. 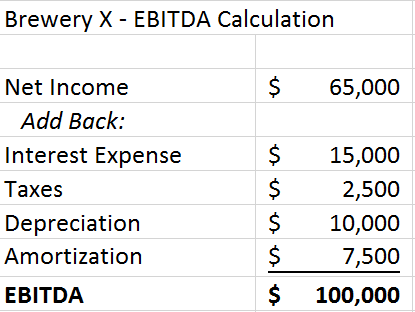 Let’s look at an example: Brewery X has sales of $500,000 and EBITDA of $100,000. Is this enough to cover the debt on the business? Maybe. Let’s say that Brewery X had to borrow $500,000 to get up and running. They have annual debt payments of $80,000 every year for seven years. That $80,000 debt payment takes quite a bite out of the $100,000 EBITDA. While EBITDA is not a perfect measurement of cash flow, it will give you a quick look at how it compares to your debt obligations. EBITDA is an important number for commercial bankers, investors and for you. 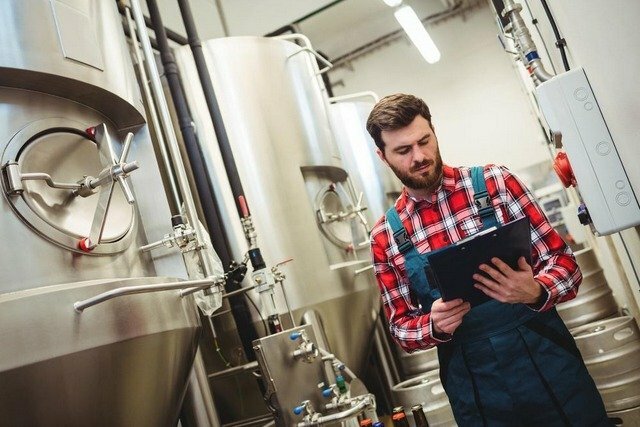 Start with a calculation of your brewery EBITDA. Compare it to your current debt payments. If you have a sizable bank loan, your loan officer is probably running these numbers for you already. Make sure EBITDA is the bigger of the two numbers. Profit is good, but EBITDA is better. Remember that cash is king to ensure a sustainable brewery. What are your views on including mandatory/replacement CAPEX in the equation in the evaluation of debt service capacity?